Loaded with dietary fiber, green beans or French beans are also known as snap or string beans. The dark green colored vegetable has lutein, neoxanthin, beta-carotene, and other carotenoids. Other vegetable rich in carotenoids include carrots and tomatoes. A rich source of antioxidants, French beans boast a good amount of B-vitamins. WHFoods recommends steaming green beans for 5 minutes to retain the maximum number of vitamins, minerals, and phytonutrients. Steaming brings out their peak flavor, besides providing moisture to retain their green color and make them tender. Being rich in omega-3 fatty acids, green beans are touted to have cardiovascular benefits. Though the amount of omega-3 fatty acid alpha-linolenic acid is not too much, it is still greater than most other sources of the same. Unfortunately, French beans benefits for cardiovascular health are underrated. Their strong carotenoid and flavonoid content gives the vegetable unique anti-inflammatory benefits. They are a rich source of vitamin K, vitamin C,vitamin B2, manganese, folate, dietary fiber. Additionally, they are rich in vitamin B1, copper, calcium, magnesium, chromium, phosphorus, potassium, vitamin A, protein, vitamin E, B6, and iron. According to the USDA National Nutrient Database, one cup of fresh green beans (about 100 grams) contains 31 calories, 0 grams of fat, 7 grams of carbohydrate, 3 grams of fiber, 3 grams of sugar and 2 grams of protein. Research studies reveal that plant foods, such as French beans, reduce the risk of certain diseases, including diabetes, obesity, and heart disease. Besides, consumption of beans gives an energy boost, improves complexion, and helps manage overall weight. As beans are a rich source of folate, you can meet your daily folate needs from the green vegetable and fight depression, regulate sleep and mood. Supplying your body with adequate folate can help prevent an excess of homocysteine, which further prevents the flow of blood and other nutrients to the brain. An excess of homocysteine is not a good sign for the brain, as it can interfere with the production of dopamine, serotonin, and norepinephrine, all of which are feel-good hormones. 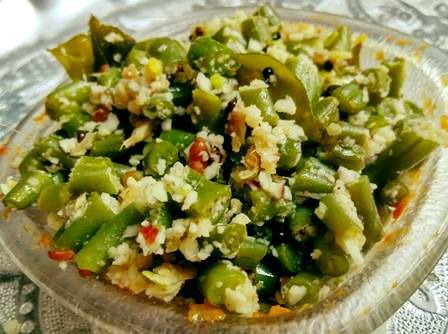 How to eat green beans? Eat them fresh in salad form or dip them in olive oil with a drizzle of black salt, pepper, and lime juice or steam them to enjoy the most benefits of French beans. But we have another way to savor this healthy green vegetable. 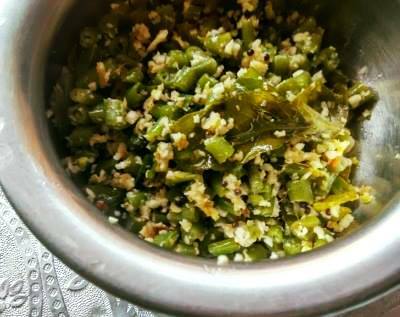 Beans thoran is a recipe from south Indian cuisine. There are different ways of preparing it. 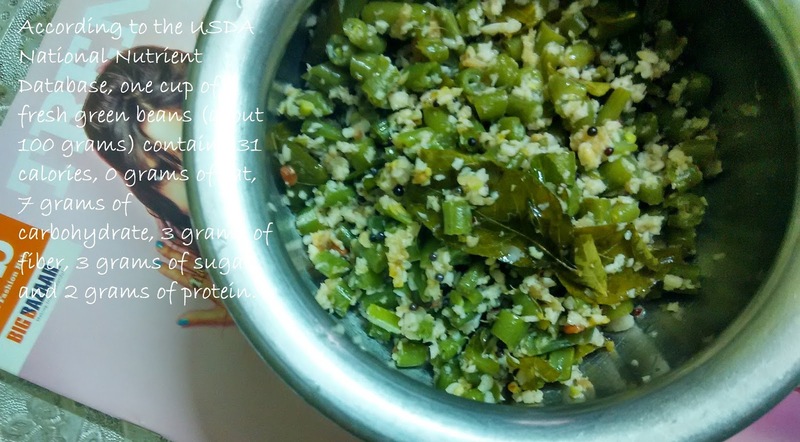 But I have modified it to my liking and here is my take on this south Indian recipe. I have blended all ingredients together and then cooked them for 5 minutes in cooker. Easy, yummy, and healthy! This method is known as one pot one shot, where all ingredients are collected and cooked in one go. OPOS has made cooking a breeze. But it requires measured cooking. Some people suggest using a 2 or 3 liter cooker for the same and then heating the same at high for 5 mins or little longer, depending on the ingredients. Chop beans finely. The smaller the size, the better. Grind coconut with ginger, green chilly, and little salt. Mix this paste with beans. Add 3 tsp water and 1 tsp oil. Sprinkle some salt and haldi. Put on the lid and turn on the flame. Turn your timer on if you are following the 6-minute OPOS rule. Or you may wait for 2 whistles and let the steam escape. Open the cooker lid and mix everything. Enjoy this healthy take on beans thoran with rice. You may be interested in beans paruppu usli recipe, which is a unique blend of cluster beans and lentils. The steamed lentils in this recipe add flavor, richness, and taste to the vegetable. I am a desi myself and love to try out different recipes and cuisines. Punjabi dishes are full of flavor and taste. These green beans are so healthy. Will suely try them out.